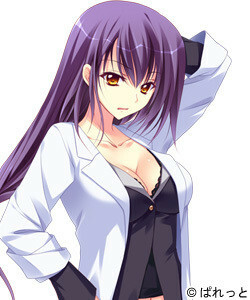 Nao is the school nurse of Mihaya Highschool. She doesn't have much motivation and hates trouble. Born in the same year as Aoi, she was the student of Yuma and Konami's father. Because of this relation, she sees Yuma and Konami as her younger siblings. When Yuma and Konami were still kids, she often comes to their home to take care of them like an older sister. She has been very close friends with Aoi ever since they were just students. She manages and supervises the female dorm, and has earned the student's admiration and reliance. She used to be Miyu's senpai back in her school days.